My best friend, John, is standing at the front door waiting to drive my eldest son to work. Eldest son is putting his boots on. Second son is watching TV, reading aloud everything he sees, as he does. Second son: Spongebob. Ninja Turtles. Reboot. John and I almost at the same time: That’s what your brother is doing. 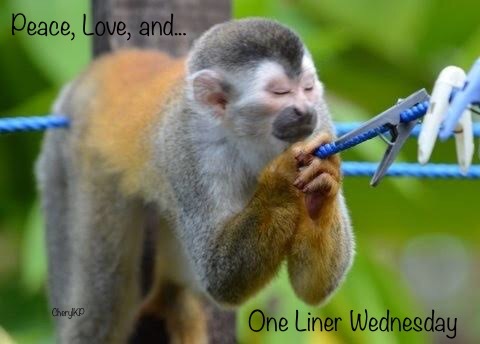 Categories: Blogging, Blogs, Funny, Life, One-Liner Wednesday, Prompt | Tags: #1linerWeds, family, Humor, humour, inspiration, WordPress, writing prompt | Permalink. Pingback: One-Liner Wednesday: Santa Cause. – Manuscript. Head. Drawer. Pingback: 2019/02/06/one-liner-wednesday-in-sync/Linda G Hill | Tessa Can Do It! Positivity is Catching! LOL – good one, that’s funny! Ha! That’s funny! Great minds twist in the same direction.